I'm in full gardening tilt around these parts. that I'm growing some lillies. I LOVE to grow lilies in my garden. 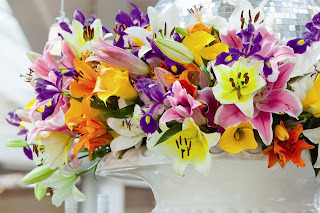 Most folks hear "lilies" and think of traditional day lilies. all the way up to GIANT versions. and immediately think there is no way they could grow them. Lilies are super easy to find in the pot. Around my parts, lilies are popular farmstand offerings. Even in pots which makes them the most fun. I love Day Lilies mixed in with tulips. to really make a modern statement. lilies really make your space pop. you can really create some WOW power. Home grown from bulbs or picked up in pots. with lots of bang for your buck. but any lily will make your day. and your love for lilies will explode. What is your favorite lily?